Roy Head : I’ve travelled all over the world. I’m one of the few white acts that played the Apollo Theatre, the Regal Theatre, The Roostertail in Detroit [pictured at right]. 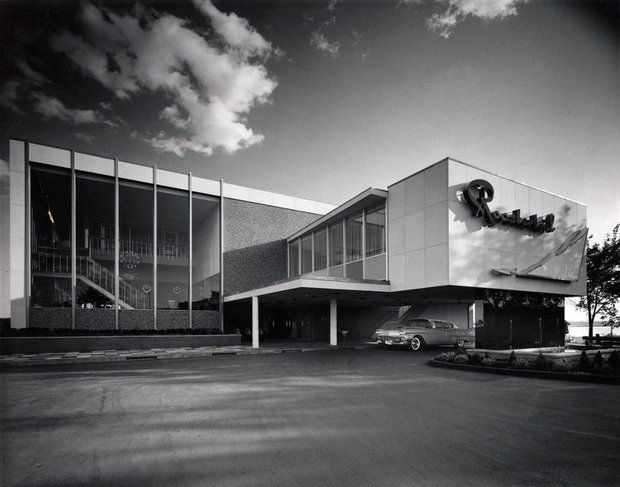 I worked at the Roostertail with the Temptations and the Four Tops. God has really blessed me. I’ve toured all over. I’ve been everywhere. I’ve played New Zealand, I’ve been to Europe. I’ve had a great career. I made a lot of mistakes but I guess you do that in life. Craig Morrison : What was a mistake ? RH : Oh, I’ve done a ton. I’ve choked disk jockeys. I’ve done everything. We used to come to Houston to play sock hops for KILT Radio and there was a guy named Chuck Dunaway. He told us, “If you’ll come to Houston, we’ll play your record.” We were like 170, 180 miles from Houston. We’d come up and do these sock hops, free. Pay our own gas, everything. I put out a song called “Live It Up.” He wouldn’t play it. Back then you could just walk in a radio station and they’d let you go up and talk to the jock. You can’t do that now. It takes an act of Congress to get in and talk to anybody. So I just walked in, he was on the air, and just started choking him. I did stupid stuff. CM : That didn’t go over too well ! My career was going down, and my brother said, “Why don’t you do country music ?” So I thought, hell, I’ll do country. That was around ’73-’74. I went to Nashville and I met Mary Reeves, Jim Reeves’ widow. Bud Logan produced some country music on me and I had probably 10 charted songs. I had “Most Wanted Woman in Town,” “Come to Me,” “Now you See Him Now You Don’t,” “Bridge for Crawling Back,” “Angel With a Broken Wing.” Then I did a song called “Tonight’s the Night” which they banned because I said “spread your wings and let me come inside.” I guess I said it too clear. They had the pill and all this stuff, like [Conway Twitty’s] “lyin’ here with Linda on my mind.” I said ‘spread your wings’ which means your arms. But country people didn’t like it, so they banned it. Then I decided, well I don’t want to do country anymore, so I walked out in 1986. I just left. I had a lucrative contract still. Stupidest thing I ever did. I should have stayed there but I called home and I said, “Look I can’t take anymore of this, the politics, and the b.s.” Carolyn, my wife, said, “Get on a plane and come home.” Carolyn’s from Memphis. We met at the Loser’s Club. That should have been an omen. CM : What is the Loser’s Club ? CM : Were you performing there ? RH : Yes. I was doing “Delilah” by Tom Jones. She and this guy got up and started walking out, getting on the elevator. I just shot her the finger. The next night she came back and came over to me and said, “What was that about ?” I said, “Leaving with that guy.” I didn’t know him at the time but his name was Jerry Williams, who managed at Paul Revere and the Raiders. She said, “He’s just a friend I was up here with, and I don’t think you’re very cute at all.” That’s how we started. I was married at the time to a girl in Houston. She came back the night after that, ’cause we were there like two weeks. One thing led to another. She was married and I was married. We both were going to have five minutes of fun so to speak. And now 30 something years later we’re still together. It ain’t been easy ! She says, “Living with you is like living in a washing-machine.” But she’s been a good one, a really good one. My son, Sundance, was on American Idol. He had the goatee. He was out there so long, they had a picture of Levi, our grandbaby, he’s about 6 months old now, with a goatee. He didn’t make the top 10 but he’s got a very lucrative career ahead of him. He writes, he plays every instrument : guitar, bass, drums, piano. He’s self taught. And he plays as good as Stevie Ray Vaughan, plays the keyboards as good as Elton John. He’s very, very good. CM : Do you play an instrument ? 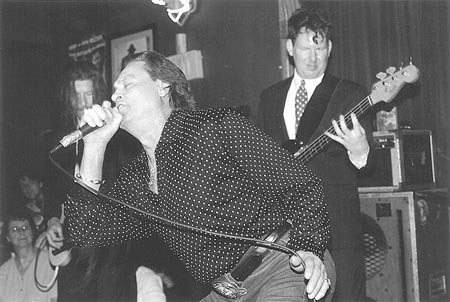 Roy Head at the Continental Club, photo John Carrico. RH : No. I never had the time I was too busy jumping around on the football like a monkey. I do splits, flips, I’m still doing all that stuff. The gator and all the mike stuff. I just never did pick up a guitar. CM : Did you have someone that you considered to be a mentor for you ? RH : Well naturally Elvis. But Elvis came along after Smiley Lewis and Joe Turner and all those people. Actually, Bo Diddley, and I really liked Screaming Jay Hawkins. He was hypnotizing, doing just crazy. I never worked with Screaming Jay Hawkins but I saw him. CM : Had you seen Elvis perform ? RH : I never went to an Elvis concert, just never did. I don’t know why, there’s no reason why. I met Elvis in Memphis. We were playing a club there down under a cellar, the Thunderbird Lounge. Richard Davis comes in, a friend of Elvis’s, well he was a bodyguard. He liked me, and said, “How would you like to meet Elvis ?” I said, “Oh god, yeah, sure.” He said, “I’m serious. He’s going to be at the theatre tonight. 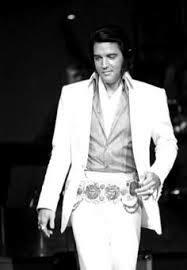 After you get through with your show, we’ll go in and I’ll introduce you to Elvis.” I said, “Sure you will. You do that I’ll buy you a steak.” He said, “You got me.” After my show that night he takes me to the Memphian, or one of the theatres. Elvis would rent the whole theatre and watch movies all night. He was a big James Bond freak. I think a James Bond movie was playing when I went. So we go in, and I went “God, there’s Elvis !” He said, “Sit down Roy, I told you, that’s why we’re here.” After the movie ended everybody goes up and eats popcorn, so he says “Come on, we’ll go and meet Elvis.” He and Priscilla were out in the lobby. He looked like a Greek god. That was back when he was thin and he never went out unless he had his show stuff on. He had this white suit on. God, I was just paralyzed. And Richard Davis says, “Roy, Elvis - Elvis, Roy,” and Elvis said something to me, I’ve forgotten. I said, “Elvis there’s something I’ve been wanting to do ever since ‘Milk Cow Blues.’” He said, “Yeah, what’s that ?” I just fell to my knees, grabbed his ankles and bit him on the calf. I really did. And his bodyguard jerked both my shoulders out of joint. That quick ! I had to have my shoulders put back in place. CM : Why did you do that ? RH : I wanted him to remember me. I’d probably had too many Willie Nelson breakfasts or something that night. I had about 50 phone calls from San Antonia one day because Elvis was performing there, it was his first stop in Texas. They said when he came on stage he said, “Is Roy Head in the house ?” and the place went crazy. ’Cause that’s kind of where I grew up. He said, “If he is, let me know so he don’t bite me.” That’s true. Now when I walk into a radio station they go, “Oh you’re the one who bit Elvis.” They don’t go, “I remember ’Treat her Right.’” I guess I’m probably the only one that ever bit Elvis. I have to tell that story over and over to George Klein in Memphis. He does that show from Graceland. Every time we do an interview : “Roy, tell them that story about us and when you bit Elvis.” I’m sick of that story. But I’m doing a lot of shows now. Thank God that I’m healthy and I’m still doing what I love to do. I’ve still got my hair and I’m not pot-bellied. I’ve still got my teeth. CM : What are you most proud of in your life or in your career ? RH : I guess my son. My music comes secondly. I’m just very proud of my son. He’s the only boy. I had a stepson, bless his heart, he was killed in a car wreck one mile from the house. He’d been to a Rick Derringer concert and was coming home and there was a little road that had no sides – you know those country roads – and he got off and he tried to correct it and when he did it flipped his truck and he broke his neck. But I’m most proud of my parents too. They were great. My greatest moment in show business was when I got to work with James Brown. I’d watch him and that big band and he’d wear out two drummers. He carried two drummers, he’d just wear them out. Man, they’d have to take a break. They’d go back and forth. He’d do about two songs and the drummers would have to rest. He was awesome ! And his songs and his breaks ! He just was something to watch. I think the greatest performer I’ve ever seen on stage had to be Jackie Wilson. He had that fluid motion, it was like he was on air. He was awesome. He was fluid, he wasn’t jerky with his stuff. He had the moonwalk. Michael Jackson didn’t do that, Jackie had that way before him. I’ve got a little bit of all of them in me I think. I just don’t have the color. CM : How would you like to be remembered ? RH : I guess as an old stage warrior. I don’t want to quit, I just want to kind of fade away. I tell my wife if I’m every up there going [sings in feeble quavering old-man voice] “I’m going to tell you a story” get me off. But I’ve enjoyed myself, Craig. I’ve had a lot of ups and downs. But the ups outweigh the downs and my father’s fathers kept me good and healthy at this point. I’m very excited about doing the show this afternoon. I can’t wait to get up there. It’s like being in my bedroom and I love being onstage. I guess that’s where I’m most comfortable. The little band that I’m working with today, they’re really young. We had a good rehearsal and I’m looking forward to it. CM : Is there anything I should have asked you or that you want to throw in ? RH : Nothing I can think of except thank-you for your courtesy and I appreciate you even talking to me. CM : It was a delight. I have one more question : what did your parents think of your music or your career ? RH : My mother loved it. My father, he was biased pretty bad. Of course he worked with them and he was from the old school. CM : You’re talking about the black and white thing ? RH : Yeah, yeah. My mother was my mentor really. I could call her any time of the night – 3 in the morning, 4 o’clock in the morning. How are you, Roy, or whatever. She was awesome. I was just brought up really good. I didn’t even know I was poor. I’m just lucky to be here, and I’m going keep on keeping on. Well I guess if I lose my teeth I’ll probably get off stage.